The energy ministries from six East African countries: Kenya, Somaliland, South Sudan, Sudan, Tanzania, Uganda, including two ministers, are confirmed to address the opening address at the East African Power Industry Convention (EAPIC) on 21 September in Nairobi. The ministerial opening session theme at EAPIC is “From Strength to Strength: Building an Enabling Business Environment”, and in what promises to be an inspiring, high-level opening to the 18th edition of this long-running, regional power conference and exhibition, Dr Albert Butare, Rwanda’s former Minister of State for Energy, Water and Communication, will be the session chairman. Several more energy ministers from the region have been invited to attend this annual meeting and contribute to the energy dialogue and collaboration for East Africa. 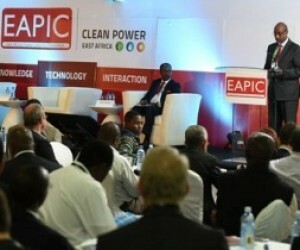 EAPIC is expected to gather more than 2000 visitors from more than 30 countries, including from the region’s leading power utilities, large industries, project developers and investors as well as dozens of technology and service providers who will showcase their products at the KICC in Nairobi from 21-22 September. As in previous years of this long running, flagship event in the region, EAPIC has already secured impressive industry support, including from Lucy Electric, a global secondary distribution leader in the electricity sector, who are this year’s platinum sponsor. “EAPIC presents the perfect opportunity to showcase our products, services and leading expertise to one of our key growth markets’ says Phil Dingle, Lucy Electric’s marketing director. Gold sponsors that have signed up so far for this year’s event are Poweroad Africa and Stanbic Bank. EAPIC is also endorsed by the Kenyan Ministry of Energy and Petroleum. The event is organised by Spintelligent, leading Cape Town-based trade exhibition and conference organiser, and the African office of Clarion Events Ltd, based in the UK. Other flagship events in Spintelligent’s power portfolio on the continent are African Utility Week, the West African Power Industry Convention (WAPIC), iPAD Rwanda Power & Mining Investment Forum and iPAD Cameroon Energy & Infrastructure Forum.